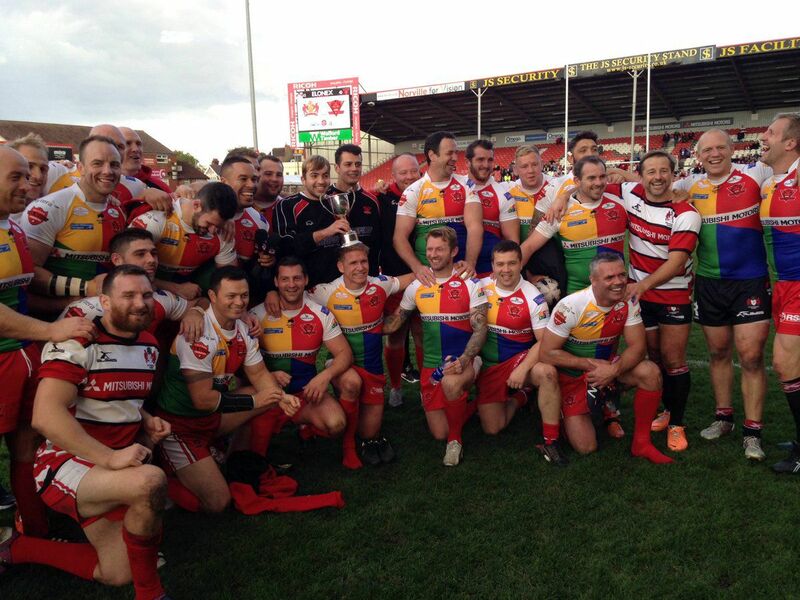 Red Devils Rugby League Legends win Hybrid cup. The Salford Red Devils Rugby League Legends won the inaugural Mitsubishi Hybrid Cup against Gloucester Rugby Union on a fantastic afternoon at Kingsholme Stadium. The game, which was played to raise money and awareness for Rugby League Cares and Rugby for Heroes, was hosted by the Salford Red Devils principal sponsor Mitsubishi Motors, in a celebration of both codes of the game. The Red Devils, lead by club legend Adrian Morley, were represented by some of the biggest names in Rugby League from years gone by, such as Sean Long, Robbie Paul and Keith Senior. There was also a strong representation from the Red Devils coaching staff, as Head Coach Ian Watson and Assistant Coach Martin Gleeson rolled back the years to play a full 80 minutes each. In the first half, the League boys faced the task of getting to grips with the rules of Rugby Union, and despite the Red Devils Legends scoring first, the Union team, featuring the likes of former England Captain Mike Tindall and former League stalwart Lesley Vainikolo soon took control and raced out to a 34-7 lead at Half time. In the second period, the Red Devils looked far more comfortable playing the more familiar code of League, and quickly began to chase down the score set by the Union boys in the first half. With about 10 minutes left in the game, the Red Devils overtook their Union counterparts and saw the game out to win 41-49.